Henry and I were sitting on the couch reading books. Jonah woke up from his nap and came staggering down the hallway toward us. He was wearing a tank top and underwear--no shorts. Henry looks up and says, "Jonah, you don't have any bottoms!" Jonah says, "Yes I do!" They go back and forth a few times. Jonah finally stopped--strange, since he is never the one to give in. He turned around, pulled down his underwear and said, "See Henry, I do too have a bottom!" Maybe you had to be there, but I was laughing so hard I cried! I innocently answer and find it's a friend who wants to chat for a minute. No problem, the boys are playing in the play room, right? I wander that way just to make sure. On the way I hear the toilet flush, followed by hysterical laughter. I try to politely get off the phone. The toilet flushes again, followed by even more hysterical laughter. Forget manners, I'm off the phone. Bathroom door is locked. More laughing behind closed doors. Henry greets me after unlocking the doors. He's holding two whistles on strings. They're dripping wet. Jonah is naked and standing by the toilet screaming, "Do it again, Henry!" This really can't be a good thing! Okay, so there's a new link for adding videos--I thought I would try it out tonight. I have a cute little clip of Jonah singing the alphabet song and twinkle, twinkle. But it seems as though it is REALLLLLLLY slow to upload. I was waiting for about 5 minutes to upload a less than two minute video. I don't know what the terms are, but the little bar at the bottom said it was at 2m of 93m, and I don't have the patience to wait that long! Maybe some other time. So instead of a fun video clip, I suppose I'll share my new haircut with y'all! I decided it was time for something new, but I wasn't prepared to see 7 inches or so of hair falling to the floor! :) It was a little scary. But I have always loved having short hair, so I definitely love it! I've had a digital camera for four years now--we decided we needed one soon after Henry was born. It has changed the way I take pictures! Well, recently we've noticed that our camera isn't as great as it once seemed. I figured that it still takes pictures, so it wasn't really important to replace it until it really gave up on me. My wonderful husband decided otherwise! He surprised me this morning with a brand new Canon Elph digital camera! I am SO EXCITED!!! It looks so great. I'm currently waiting for the battery to charge up so that I can play with my new "toy" and see just how cool it really is! I'm posting some of the pictures from my old camera today, and hopefully tomorrow (or so) I'll be able to post some great new pictures--and maybe even a video--my new camera even does that too! Here's my sweet girl in her usual sleeping position--arms up! You don't want to know how often Jonah walks around like this. He used to just take his pants and underwear off after going potty (and leave them off) but I told him it's important to keep them on. So now he just doesn't bother to pull them back up. Wouldn't you think it would bug him walking around like this? Clearly it doesn't! And here's my soccer star. He had practice last night with the other kids from his team. It was a riot! Sam and I sat on a picnic blanket and watched as seven little kids ran around in circles and occasionally kicked the ball! The bond between these two is incredible. They sleep in the same room, get up at the same time, choose clothes for each other (matching, if possible! ), and they make all their decisions about their day together. You'll rarely see one without the other throughout the day. This week, Henry will have his first soccer practice--without his brother. In two weeks, Henry is starting preschool (two days a week)--without his brother. That same week Awana starts back up, and Jonah isn't old enough for that yet either. I'm sad for Jonah! I don't think he truly realizes that he and Henry are almost two years apart in age--in his mind they are equals. So I'm sure he is going to feel left out. I know that his relationship with Bridget will eventually grow stronger as they have more time together, but right now she's too little to hold his interest. He's such a tender-hearted little boy, and I just want to protect him from everything--including hurt feelings! When it's nap time . . . .
. . . . Daddy makes the best pillow! Bridget's first bath and photo shoot! Bridget had her first tub bath this week, and she LOVED it! How fun! Of course I had my two little helpers....they brought out step stools and washcloths and asked if they could help me--how could I say no? They are so sweet! My mom sent us a dress that I had worn as a newborn. She was afraid that it might already be too small, and it was close! But we got some pictures of it today--I think she looks like a little doll! The bonnet was a gift from Sam's mom. Isn't it cute? So dressing up a little girl really does feel like I'm playing with dolls. I LOVED my dolls as a little girl, so this is a very fun time for me! 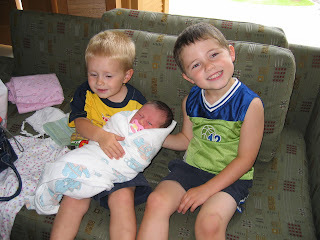 I wouldn't have thought that having a girl would be so different from having boys, but it certainly is! This past weekend was graduation at Teen Mania. The August interns had their graduation on Saturday, but on Friday night they had their "Gala Celebration" which is a nice dinner and live orchestra--and for us, a rare opportunity to dress up! The boys were so handsome in their little suits--they were very excited at the chance to wear them! Although I do think the highlight for Henry was seeing all the girls in their pretty dresses--we heard him say "Oooohh, you look pretty!" about a hundred times! He was rather charming! Bridget wore a casual sun-dress. 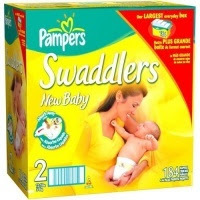 I don't have any fancy dresses in newborn size, and I just couldn't see buying something that she would outgrow before another opportunity to dress up comes along! She spent the first part of the evening sleeping in Auntie Beth's arms and then the rest of the evening tucked under the table--it was pretty cozy for her! And here's the boys--need I say more? Our local Lowe's (home improvement store) has a free kid's project once or twice a month. They provide all the materials, give the kids an apron, eye protection goggles, patches and awards of completion, and they supervise the whole thing. It's great! We went to one right before Bridget was born and let the kids build their own tool boxes. It was too fun! Then we went home and continued the fun by painting them. The boys have been carrying them around (sometimes filled with "tools" and sometimes filled with whatever they come across!) and having a ball with them! Bridget says "Hi" to Mommy's blogging buddies! These two are forming a VERY special bond. Henry calls her "Fish" but also "Sweetie Pie" and he is really doting on her. He picks out her clothes every morning and never forgets a bow for her hair! Henry loves to check on Bridget while she is sleeping....he tiptoes into her room, leans over the crib and whispers to her and gives her kisses. Too sweet! Here's the crew, hanging out together this morning! So far this baby is such an easy, lovable, snuggly little one! Bridget is sleeping well and she just always seems happy and content when she is awake. God is so great! Bridget is exactly what we prayed for and asked for--such an incredible blessing! 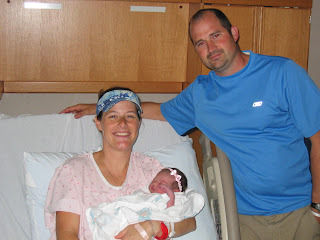 Here's the new mommy and daddy with Bridget. The best two big brothers a girl could ask for! Here's me and my new babe. Bridget arrived pretty quickly, so she was still looking a little blue at this point! 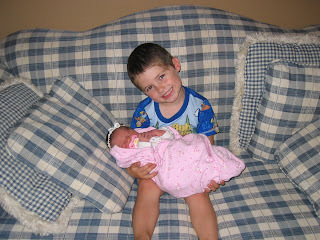 Henry holding his new baby sister at home. He REALLY loves his little sister. Sam and I can't believe how mature and responsible he has been acting today. . . . we are so proud of him! 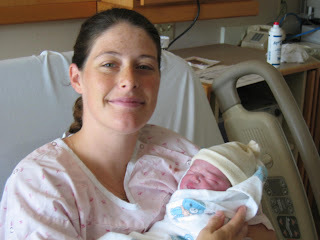 Well, we had our baby girl--July 31, 2007! The Lord blessed us with a BEAUTIFUL little girl! She has a full head of dark brown hair, super long fingers (with nails that already need trimmed!) and a very sweet disposition. Mommy is recovering well--we're home from the hospital and everyone is feeling great! I'll post pictures when I find time to get them from the camera into the computer! Until then, my wonderful sister-in-law Beth has put one up on her blog site for us!